This push puppet was made back in the 1960s for Kohner Brothers. 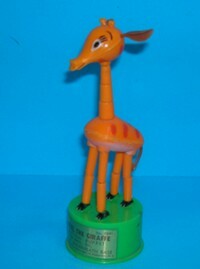 Gabriel the Giraffe has a clean gold label on the front of the stand which reads - i'm Gabriel The Giraffe - No 3991. Push Button Puppet. Push Button Underneath Base. Made in Hong Kong for Kohner Bros. Inc. N.Y. Overall condition is very good - both ears are intact and tail are intact and there is no major paint loss. The label is clear and bright. There is some glue residue on the back of the stand where it looks like the original store sticker may have been removed.